Jazz is not what comes to mind when some people think of Joni Mitchell. But that’s exactly what Mitchell considers her music to be, according to Leslie Ballard, flautist and vocalist for Joni Mitchell’s Jazz. The seven-member group will celebrate Joni Mitchell’s 75th birthday by playing to audiences at the Edmond Town Hall Theatre in Newtown on October 13. The $20 tickets are available online and proceeds will go to the Edmond Town Hall restoration fund. “Some people don’t realize that Joni’s big hits are in the jazz genre. Miles of Aisles, Shadows and Light, Court & Spark, Hejira are all jazz albums. She has worked with many well-known jazz artists including Herbie Hancock, Charles Mingus, Pat Metheny and Jaco Pastorius. Our band acknowledges that she is a jazz musician, even though some may not recognize her in that light.” says Ballard. Joni Mitchell almost died in 2015 from a brain aneurysm. 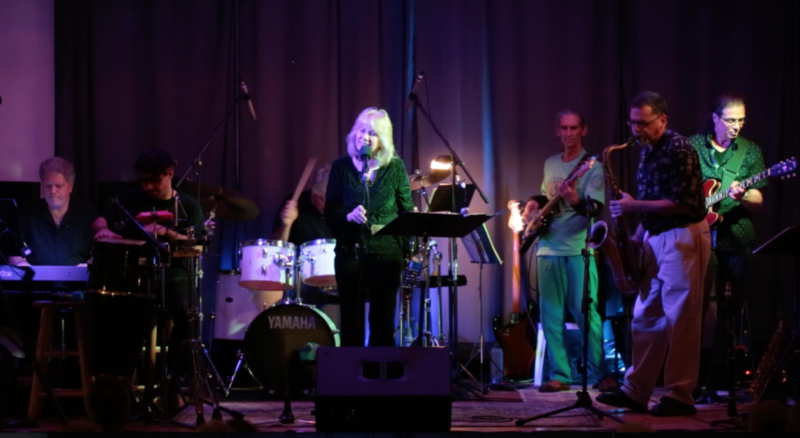 On November 7 she turns 75 and in honor of her gifts and achievements Leslie Ballard and Joni Mitchell’s Jazz band will come together to perform and share her acclaimed music. Audience members will be able to record comments on a video e-greeting birthday card for Joni. The concert is a tribute to a premier songwriter, guitarist, singer and producer whose name appears on many lists of superlatives: Rolling Stone’s 500 Greatest Songs of All Time, 500 Greatest Albums of All Time, 100 Greatest Songwriters of All Time, and many other accolades. JM Jazz’s last Edmond Town Hall concert was a sell-out. Five members of the band, including Ballard, are Newtown natives and they share the community’s love for the theater. Band members include Leslie Ballard (flute, vocals) Steve Zerlin (bass), Roger Post (drums), Matt Spencer (percussion), George Lesiw (guitar), Steve Moran (sax), and Christian Martirano (keyboards). Ballard has a long and broad musical history, starting her career at age 15 in her brother’s band, Panacea, when he sought to include a girl and a flute as a unique feature. She played in the band Woodwind CLEJJ throughout her 20s and then moved to New York City, managing recording studios. She has done back-up work for many albums and performed with the Amato Opera in New York for several seasons, after studying with Leslie Carrington of the Metropolitan Opera. Edmond Town Hall Theatre is at 45 Main Street in Newtown. Doors will open at 7 pm and a wine bar will be available. Audience members will be able to record comments to a video e-greeting birthday card for Joni. Tickets are $20 and are available online. Proceeds from this concert will go to the historic theater’s restoration fund.